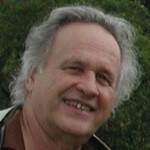 Energetic Integration Article Jack W. Painter, PhD. 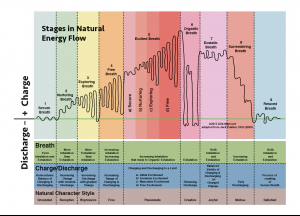 Click here for Charts of the Energetic Cycle, developed by Jack W. Painter, PhD. Jack W. Painter, Ph. D.
Breathing is a normal, essential function in our lives. We are, of course, concerned that our breathing passages, bronchial tubes, lungs, diaphragm and other parts of the breathing apparatus are healthy and provide us with the necessary exchange of oxygen and carbon dioxide. We even embark on aerobic and physical therapy programs to enhance the functioning of our respiratory system. There is no doubt that improvement in our respiratory system will also lead to improvement in our metabolism strength and endurance, perhaps even to beneficial effects on our emotional well-being and cognitive efficiency. These aspects of breath, important as they are, do not capture a dimension in breathing which is the key to a deeper, more whole vitality. Consider that amazing phenomenon known as a “second wind.” Most of us have experienced this in the hearty play and sports of youth. Just at that moment of exhaustion, as we are gasping for air, suddenly our breath comes easily and we move almost without effort, as if carried along by a special force. We move easily, yet uncannily are aware of our limits. We know that if we over-exert ourselves, we will quickly reach exhaustion. We know just how much we can speed or slow our activity and maintain a maximum efficiency of movement, and so long as we maintain this special breathing and attitude our power remains available and enduring. With a second wind all our physical, emotional and mental functioning comes together to produce an extraordinary vitality. And as we examine our lives we begin to find other examples of this vitality: moments of special loving and sharing, the finishing touches on a job well-done, dancing with grace, a consummately delicious taste, the satisfying surrender of pent-up emotion. Whether in the form of a sigh, soft shutter or ripple, our breath, in these cases, moves without hesitation through the length of the torso, even up into the neck and head and down into the pelvis and legs. Along with this free breath, our feelings and thoughts flow with unusual ease and clarity. There is a kind of wholeness and unity within us, where our bodies, emotions and mind are in synchronization, in special harmony. So, we find that breath is an essential key to the unified force within us. In Energetic Integration, a bodymind approach which is designed to meet the needs of each individual client, the practitioner works with the client’s breathing to help open the way to this wholeness and force. In preparing the body tissue to relax or mobilize, in opening intensive feelings which have been held deep inside, in helping one focus in the midst of overwhelming feelings and thoughts — in all these, working with the breath is an indispensable and powerful tool. As we look at the mechanisms of breathing, the patterns of inhaling and exhaling, we discover how breathing brings us so quickly and deeply into ourselves. Basically, inhaling is a way of charging, while exhaling a way of discharging, and it is in this capacity to build or disperse our energy that we contact (or fail to contact) our wholeness. As we breath we encounter in microcosm the pattern of our lives — the way our “energy” begins, surges, sustains itself, softens and reaches a kind of resolution. When whole, when in contact with our inner selves and environment, we flow through a natural charging-discharging cycle. We build our reservoir of power to a certain limit, use up this reservoir, then begin again to increase our storage of energy. Whihelm Reich’s formula for this wave or pulse-like movement — tension, charge, discharege, then relaxation — gives us a starting point from which we can elaborate and describe an even richer, more detailed process. Each of us creates complicated, recurring cycles out of the streaming welter of desires, impulses, hesitations, frustrations, pauses, retreats, peaks and valleys which characterize our everyday lives. 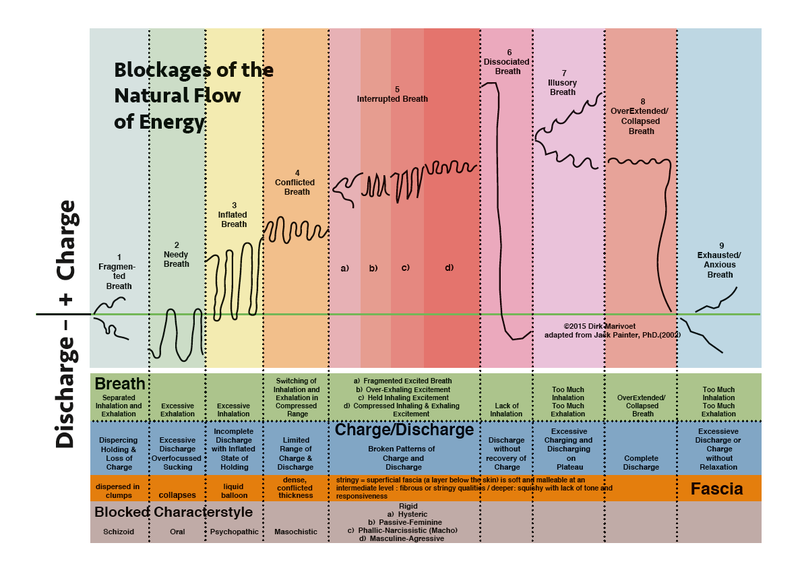 The practitioner, the Energetic Integrator, helps the individual begin to experience this energetic cycle and better understand and control various patterns habitually used to cope with the onrushing energy flow: our tendencies to rapidly overcharge, to undercharge, to explosively discharge, or to repeat over and over the same kind of wave. The healthy individual is one who can allow the cycle of energetic charge and discharge be complete. By nurturing our exictement we reach a point where we can fully discharge, where there is no left-over energy in the form of anxiety. Now we can live the energetic cycle, regulating our energy as needed, able to fully charge and discharge, unencumbered by society or its internalized blocks. It is not enough to fully accept and express one’s own energy without realizing that there are many demands and stresses in our environment. In the very nature of our flow there are cross- and countercurrents which are essential to our vitality and completeness. The question is not whether we can be free of these but the degree to which, through interacting with the strong needs and demands of ourselves and others, we continually learn to absorb, convert and redirect these opposing forces. We see that in every manifestation of our energetic activity, whether physical, emotional or cognitive, there appear sooner or later limitations, counter forces, which become part of the unconscious structure of our bodyminds. Counterpulsations, the shocks that ripple through our musculature, become the static, held-in contractions of our bodies — tight diaphragms, tucked under pelvises, clenched jaws. Unbearable pain turns into layer upon layer of repressed emotion — swalled pride, an aching heart, contained fury. And our thinking, in a grandiose attempt to reach clarity and certainty, decevies itsef — overly ambitious schemes for individual and social reform, fantasies of omniscience clarity about our feelings and bodies, strained attempts to make our theories more complete and consistent. As we work with an Energetic Integrator, we find in our own bodies and minds such roadblocks to the free passage of our vitality, which are also there because the increase and expansion of our energy requires this opposition. Muscular contractions can choke off movement but also become its propelling force. Anger can be destructive or transformed into creative power. And cognition can be dogmatic or the door to sharing and opeing new possibilities. It is important for us to realize that the continuity of our energy depends on this opposition and the healing and transformation of ourselves lies in interaction with and assimilation of those forces most opposed to us. We need the stimulation and enrichment of the unavoidable cascade of new and conflicting energies which impinges on our lives, yet from the beginning, even in utero, in the fear of pain and confusion, we often deal with these forces through denial, suppression and distortion. Through our infancy and childhood we build patterns of protection with which to handle supposed threatening outside energy. We can see this in our bodies: if I am in a state of peretual preparedness, my tissue and muscles will become chronically contracted. If I am afraid to react because of the hurt which may follow, I become unresponsive and flaccid. We can see that when our natural protective system becomes a habitual part of our bodies and attitudes (even when not needed), we have developed an armor against living in the present moment. Reich saw this armor as forming in rigid bands around the body. Our natural spontaneious movement, a fine vibration of streaming energy and feeling throughout the body, is broken by these immobile segments around the eyes, mouth, throat, chest, diaphragm, belly and pelvis. Each band of armor holds a part of our character, our habitual way of coping with ourselves and society. Reich saw armor as a rigidity of emotiona response, accompanied by contractions of the musculature. But armor can also be unresponsiveness and consist of tissue, which is loose and flaccid. In both the case of hard or soft armor, we suppress, to a large extent, our consciousness of the attitudes which we have locked in body and mind. These are bands or segments of armor, and clearly the way we organize thes bands — for example, more around a tucked under pelvis and drooping shoulders or more around an arched back and overextended neck — has to do with an overall pattern which took shape in our infancy. These patterns reveal our character structure, the most general fixed attitude we have carefully developed for confronting life’s forces. Many investigators have been intrigued by character structure and their investigations have spawned an elaborate, diverse, often confusing network of types for classifying the individual’s defenses — oral, schizoid, psychopathic, masochistic, rigid, phallic, pranoid, etc. But whatever label or definition is give, what is more important is that the individual begins to experience his or her own defenses. In order to free our blocks, to claim our full vitality, we need to discover how we organize our armored segments into an overall defense against pain, into the deepest, most stubborn patterns we use to undermine ourselves, the ways we preatedly, and always to some degree unconsciously, deny those very thoughts and feelings which would help us to flow more smoothly. With the help of the Energetic Integrator I can begin to explore how I am a mixture of various structures. Through work with my breathing and the defensive tissue of my armored segments I begin to see how early in my life I started carrying a heavy responsibility, contracting, holding a high, perhaps explosive, charge inside me and that this part of me is so inflexible that I can say I am “masochistic.” And as the integrator continues to help, I begin to uncover an even earlier neediness, an almost desperate part of me that is never filled up, which I can consider “oral.” These labels are temporary markers that help us explore and interpret ourselves, and can be changed or thrown away when they do not fit our experience. The Integrator is there to help the client experience, interpret and accept these stubborn structures, and with this knowledge ope the way to new, more flexible and vital ways of living. Wit the practitioner’s help we can play with structure, trying on some and changing them for others. This discovery of structure is not merely a cognitive recognition or awareness, my conscious recognition comes through the energetic acts and are equally affective and cognitive. Consciousness of our character structure, of our defense systems, unfolds and is created by a dialogue which we conduct by becoming aware of what we have hidden within us and also aware of what new attitudes, feelings and actions are available to us. A part of this discovery, of this inner ongoing dialogue begins right at the outset of an individual session with a practitioner. What is called a “body reading,” or better “bodymind reading,” is not really a “reading” of the client’s structure by the practitioner, but is rather the setting in which practitioners support clients’ discovery of a network of energy and feeling which helps reveal the underlying and partly hidden aspects of themselves. Since each of us has a unique history of joy and sorrow, success and failure, we each have our own particular pattern of character defense. To let go of our armor, to begin to feel our power and flexibility, we each need individual guidance, a step by step process of discovering our own potential. The Energetic Integrator is there, working simultaneously with the client’s breath, tissue, emotion, thoughts, but also with a knowledge of how the bodymind may be encouraged to open its complicated knots. The sessions in the process may be divided into three phases, a beginning phase of mobilization, a deeper phase of confrontation and resistance, and a final phase of integration. Mobilization. In the initial phase, the Integrator helps the client mobilize and circulate energy and feelings. Perhaps there is need to charge parts lacking in energy — nurturing a sunken chest, filling-out think legs, vitalizing dead pockedts of tissue. Perhaps there is need to discharge excesses — releasing pent-up tension in the shoulders and neck, encouraging a stiff neck to surrender, relaxing controlling buttocks. Release. Once the energy is mobilized with more charge and discharge happening throughout most of the body, the client will begin to come up against a deeper resistance, the subtle and extensive pattern of his character defense. Here the practitioners respects the need of the client not to confront the deepest pains until there is trust and security. The gradually discharging process becomes more and more complete, until there is an experience and release of very deeply held energy and a more conscious realization of one’s old patterns. A wonderful world of freedom opens up: one feels present, in contact with oneself and others. Integration. The tissue has become softer; movement more flexible. The emotions come more easily and flow into one another. Yet in the widening of one’s possible responses and actions, there can be confusion. New feelings are present and need to be translated into everyday behavior. New thoughts need to find new conclusions. When we change fundamentally, we need time to integrate the new into the old. Breahwork is now lighter and more meditative. Movements, sensations and feelings are synchronized into a delicate, connected, sensual flow. During all these phases the Integrator uses a number of flexible strategies. Often it is important to work with upper segments — those around the eyes, mouth and throat — before releasing the blocks of the belly and pelvis. If the anger and sadness of our sexuality begins to explode upward in the body without a clear path of expression through the throat, mouth and eyes, we may, with great frustration, push this rush of feeling and energy down again. Once we can fully express ourselves above, the circulation of energy from below can be complete. The desire in the pelvis can join the receptivity of the heart in a complete cycle of flowing feeling. The extraordinary power of Energetic Integration lies in the willingness of client and practitioner to work on many levels at the same time. As I, practitioner, encounter the body with my fingers and hands, charging or discharging the energy in the segments of armor, I look into my client’s eyes. And as I softly touch or stimulate, I ask the person to share through sound, movement and words what is happening — what is sensed, felt and thought. By maintaining this contact, this open sharing, the practitioner can be flexible enough to change the emphasis of the work to meet the changing demands of the whole person. The practitioner and client work together, now with tissue, now with words, now with breath and sounds — all the time recognizing the physical, emotional and cognitive unity of the process. This kind of sharing is especially important as the client is helped to restructure the old, stubborn patterns of character, to re-experience and accept those fragile, powerful and beautiful parts of the self which have been denied since early childhood. Postural Integration, like Energetic Integration is a wholistic, unified approach to working with bodymind. Both work with breath, emotion, thought, tissue and movement in helping the individual to freedom and vitality. Whereas Energetic Integration focuses on freeing and integrating the energy which is blocked in the individual’s character structure, Postural Integration® systematically releases and organizes the layers of fascia which envelop the body’s muscular system. Postural Integration® is a step by step process. During the first seven steps, the legs, pelvis, torso, arms and head are each thoroughly and deeply released, and then in the final three steps are carefully brought into a harmonious relation to each other. During the practitioner’s deep movements into the client’s fascia — with fingers, fists, knuckles and elbows — a remarkable phenomenon occurs: the tissue becomes markedly softer, more consistent, resilient, and also more malleable. This can be felt from the superficial surface through the body of the musculature and down to the deepest tissues. With this release the body begins to find new proportions. Wide hips become more narrow, small chests expand, torsos lengthen, faces relax, buttocks fill and round-out. At the same time emotions and thoughts become more flexible. Energetic Integration and Postural Integration are very similar in their goals and methods. The difference is one of emphasis. 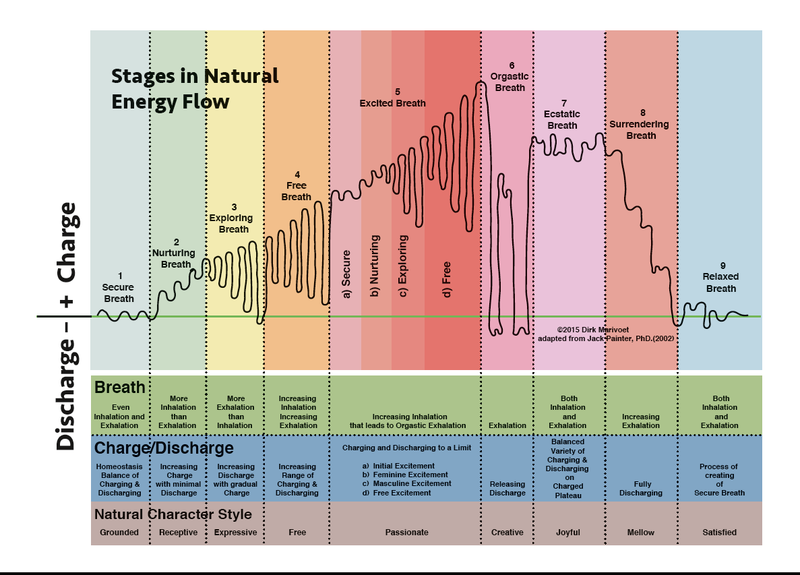 In Energetic Integration the focus is on regulating the energetic cycle and restructuring character, and the tissue work is that which aids in the charging or discharging of segments of armor. In Postural Integration® the focus is on systematic work in releasing and organizing layers of thickened fascia and opening and balancing posture, while at the same time, freeing breath and emotion. Those individuals who are attracted to receiving deep work in the tissues of their bodies, may find Postural Integration a natural strting point, while others who are more drawn to energetic and emotional expression may find Energetic Integration more suitable. In both approaches, however, there is, finally, a unified, wholistic approach to body and mind, to tissue, breath, movement, feelings, thoughts and attitudes.